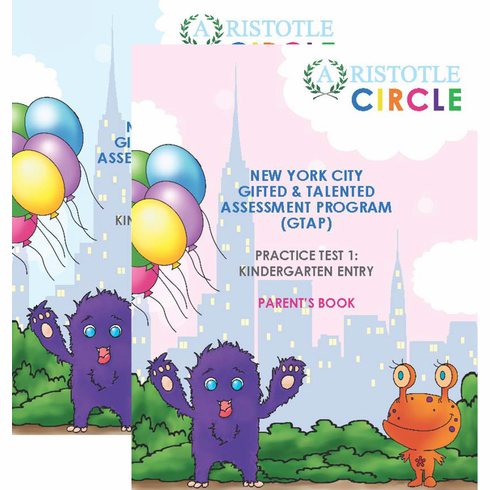 This New York City Gifted & Talented Assessment Program Practice Test for Kindergarten entry will help prepare your child for this new entry test and demystify the test content. The New York City Department of Education has implemented significant changes to the Gifted & Talented (G&T) admissions test for the 2013/2014 admissions year. Students wishing to apply to G&T programs must now take a test that consists of Non-Verbal and Verbal tests vastly different from previous years. The Nonverbal test measures reasoning and problem-solving skills through Pattern Completion, Reasoning By Analogy, Serial Reasoning, and Spatial Visualization Question Types. This test is worth 50% of your child’s total score. The Verbal test measures verbal comprehension and verbal reasoning through Aural Reasoning, Following Directions, and Arithmetic Reasoning Question Types. This test is worth 50% of your child’s total score. Just like the official New York City Gifted & Talented test, this practice test consists of Non-Verbal and Verbal tests with questions structured and presented similar to the actual test. Our Performance Guidelines will help identify your child’s strong and weak areas to best prepare for test day. Aristotle Circle's goal is to give parents choices and expert advice to make informed decisions. In addition to practice tests, we offer test preparation materials, child assessments, tutoring, and expert advisory services to help navigate the admissions and education process, from pre-school to post-graduate level.